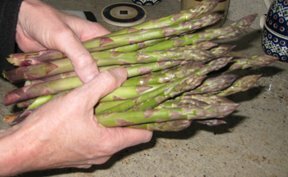 There’s nothing better than asparagus fresh from the garden! We harvested our first spears this morning and roasted them in the oven for lunch. For a real treat, toss spears with a little olive oil, sprinkle with coarse salt, add freshly ground pepper. Roast in a 400 degree oven (or grill) for about 15 minutes or until tender-crisp. I have never cooked asparagus this way. Thanks for the idea! Our 4-H kids are actually considering eating asparagus with such a creative recipe! Me too! Sadly, weeds are choking mine out.. I have some kind of crabgrass or wiregrass or bermuda grass (not sure) that is impossible to control. I’m on the Shore. A request — what do you recommend planting now that we’re close to last spring frost? When should I put in cucumber seeds? Heather- you can start planting beans, cukes, squash, Swiss chard and lots of other vegetables on the Eastern Shore right now. Check weather forecasts closely before transplanting tomato, pepper, eggplant, and basil because are easily injured by temperatures in the low 30s- especially eggplant and basil. We have a planting date chart for vegetables on our HGIC web site. Just click Publications < Vegetables. Ah sweet delicious asparagus….it's that time of year again. Just made a Gnocchi dish with Asparagus and bacon. Thought you may enjoy it: http://www.noreciperequired.com/recipe/gnocchi-asparagus-bacon. There's a video to follow to show you how to do it.